As we age, the skin of the face and neck starts to sag. Many people develop redundant neck skin losing its previous youthful appearance. 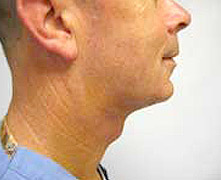 Besides lose neck skin, some people have excess fat in the neck which causes the neck to bulge. There are several ways to improve the appearance of the neck. Face and neck lift have been historically performed which requires placement of incisions behind and/or in front of the ears. 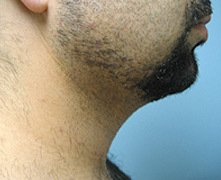 In some patients, sutures can be used to lift the skin of the neck which has inconsistent results and variable duration. 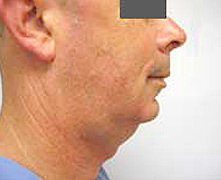 In many patients, an effective neck lift can be performed through a less than 1 inch incision hidden behind the chin. With this minimal scar neck lift no incisions or scars are placed behind the ears or on the face. In addition to creating the curve of the neck, the double chin can be improved or eliminated. This operation lasts about 30 minutes and can be done under local or general anesthesia. This minimal scar technique allows for faster recovery and faster return to work. 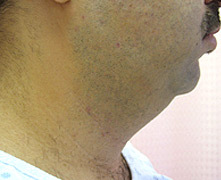 This patient is 4 days after the minimal scar neck lift. The neck shows a significantly improved shape and no double chin appearance. Even 4 days after surgery, the chin incision cannot be easily seen. No incisions were used in front or behind the ears.